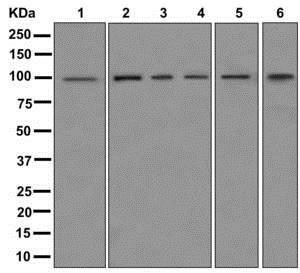 Recombinant fragment within Human HID1/DMC1. The exact sequence is proprietary. Our Abpromise guarantee covers the use of ab175926 in the following tested applications. WB 1/1000 - 1/5000. Predicted molecular weight: 89 kDa. May play an important role in the development of cancers in a broad range of tissues. Expressed in heart, skeletal muscle, colon, spleen, kidney, liver, small intestine and lung. Highest expression is seen in brain and placenta. Loss of expression is seen in some breast, cervical, hepatocellular, lung, thyroid, gastric and renal cell-cancer lines. Belongs to the UPF0663 family. 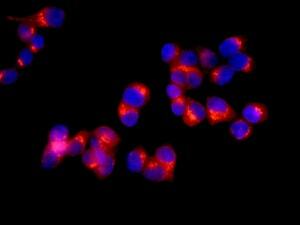 Immunofluorescent staining of MCF7 cells using labeling HID1/DMC1 with ab175926 at 1/100 dilution (red). DAPI nuclear staining (blue). ab175926 has not yet been referenced specifically in any publications. Publishing research using ab175926? Please let us know so that we can cite the reference in this datasheet. There are currently no Customer reviews or Questions for ab175926.